Gmail added a long-awaited feature: making phone calls. If you install the voice and video chat plug-in, you can call phones in the US and Canada for free. You can also call in other countries, but you'll have to pay. Fortunately, Google's rates are really low and the service is cheaper than Skype. "Calls to the U.S. and Canada will be free for at least the rest of the year and calls to other countries will be billed at our very low rates. We worked hard to make these rates really cheap with calls to the U.K., France, Germany, China, Japan — and many more countries — for as little as $0.02 per minute," informs Google. If you have a Google Voice phone number (anyone in the US can get one), you can also receive phone calls in Gmail. Now that Google Voice integrates with Gmail, a lot more people will use it. To try the new feature, make sure that your Gmail interface language is set to English (US) and that the voice and video chat plug-in is installed. You get an initial calling credit ($0.10), but unfortunately you can only add credit if you're in the US. I don't see the option to call and I have the plugin installed. How do I get it to work? Visit www.google.com/chat/voice With a desktop computer. Who is this intended for? Most in the US have cell phones already. I have one but it costs me minutes in/out with limited number of texts too. The main advantage is that you have a buffer between you and the person you are calling. Example would be you call a hotline to complain anonymously. If you use your cell they get your real identity and can give you problems later when you go back to a company to do business. With google it would be anonymous (except for law enforcement of course). Just be forewarned that anyone can subpoena google records easily in a civil suit (look up right of discovery). So, if you want to be anonymous just be nice and don't do anything illegal or anything you could get sued for. Plase note: for those who want to do bad things with this technology, google DOES record hardware ID's, especially your MAC address and IP address. You can be traced anywhere in the world. Another interesting fact: phone calls to say bill collectors for example - calls only protect their interests not yours. I believe that google phone is designed and intended for a typical phone call - nothing important. I can't get it to work at all and no call icon either in my gmail. Google voice want a CC which I don't have. Target stores sell skype phone cards. That's great service from Google! Useless unless they make it avalable worldwide. When I changed to Google from Yahoo was because I felt that Yahoo U.S. users get it all while Worldwide users had only the basics, I'm starting to have this feeling again with Google. Would be nice if it worked for Canadian users since you can call "anywhere in US and Canada". Works fine for me in Canada. My language is set to English US however. Would be nice if it appeared in my google apps account though, I prefer to use that now. Great service!! News about release of google voice in Italy?? I can spend my 10 cents they've credited me with, but i can't top up after that until they open Google Voice internationally. I hope that comes soon! Finally! A step forward for Google Voice. Glad to see that they've finally opened it up a bit so that people other than those in the US can use the service. Now if only they would allow users outside the US to get their own Google Voice phone number. The news is that you can make phone calls, but the plug-in is voice and video chat... Is the video chat available too? can some one tell me how it works..i dont see the call phone icon in the chat window!!!! I have the plugin installed AND tested, and it works fine. But I don't see any user interface controls that will allow me to initiate a phone call. Where are you finding those controls? Very slow to roll out, still not showing up in some accounts. Hey guys! I just topped up my credit, using a Visa Electron card issued in Slovenia (Europe)! So Italy, things might not be over yet! Perhaps for non-US countried you need "Electron" or similar (an online, no-credit card) to be able to top up? Also, I don't know if it might be related, but I have since earlier tried to enable "Google Voice" just after US-public launch with error messages of "sorry, not so fast". Wow, this was quite a surprise this morning! I'm in the UK with UK English set as my language, and it shows up. What a shame I don't know anybody in the US or Canada to call, but I have friends spread all over Europe, so the cheaper calls are very welcome - if I could top up! This doesn't seem very well integrated with the rest of Gmail though. In the Contacts list, there should surely be a 'call' button next to phone numbers that I've entered. Nearly all of my contacts have their phone numbers. The same option should be available from the contact card - Email - Chat - Call phone - Call Computer - Video call to computer. No? And while I'm at it, why not have phone numbers listed below the email address in the contact card? Also, they need to tidy up their tariffs, since some of them just don't seem to make much sense. Take Italian mobiles for example: 'Italy Mobile' is listed at $0.30, but then every Italian mobile operator (3, TIM, Vodafone & Wind) are listed individually at $0.21. So what's the $0.30 referring to? Same with needlessly having both 'France - landline' and 'France - Paris' listed separately. Why? Nice to see this though - just needs to be tidied up a little and thought out a bit better in the interface. You did not mention that currently only US and Canada users can use this service, others will have to wait. Not exactly. You can call to any phone number in the US and Canada from anywhere in the world. Well I'm in spain right now and I have the option to make calls from within my gmail, but unfortunately it does not work, I seem to have an amount of 0.10$ but the voice always says "we could not complete your call, please try again". The page where I'm supposed to add credits does not work either. International top up possible, it's Google Voice interfaced via Gmail, now all they need is to add countries for incoming calls. Probablky done as they get the relevant paperwork sorted, and negoiate a deal they're willing to work with. I do not see "Call Phone" option on one account whereas I see on another account being on same computer and browser. But I do have google voice account for the account this option is not popping up. Could anyone help me out getting "Call Phone" option on my other account. wonder when it will come across europe? Works with the English (UK) langugage setting however I use Opera as my main browser and the plugin doesnt seem to work which is a pity. Works Perfectly...I'm in Toronto and it works like a charm.. I just topped up from the UK via google checkout, works perfectly! Yo solo en espera a que llegue este servicio en Mexico, es una pena. Porque de lo contrario todos los mexicanos sin exepcion estarian con Google Voice saludos a todos.. I have the phone call icon on some of my gmails, but the other 2 gmails the icons are missing. I can't figure out what I need to do. Help anyone. like a couple of others above, I am in the U.S. have both google voice and google voice/video chat and have never seen the call phone option in my gmail account. I tested this and it seems that CallerID works now. A call from my Gmail account to my home phone shows my Google Voice number. Before it had shown the number for Google 411. I'm in Poland, on Linux, set the language to Eng (US), topped-up with Google Checkout and it works like a charm! With a slight delay on the receiving end, but still fab. Thank YOU Google! Thank you, thank you! The call phone application is absolutely wonderful and incredible! I LOVE it and that it is available in Canada. I am just thrilled with this new communication tool. I'm also wondering if we just call someone and use their call display to find out the number we are calling on? Are these numbers assigned to an individual IP address or to each gmail address? I'll have to test it out. So much fun playing with new Google stuff like this!! I like your post about the phone. Have you ever tried for your blog? If not, you must try for your blog. I noticed that Google Voice gives you the option to call Google Talk when making an outbound call. Nifty. I called hawaii from british columbia,it worked good on my end but not so good on their end.can it be tuned in better some how? I call new zealand from Papua New Guinea and it work well from my end but the recipient end wasn't any good. Can't get a respond. Can it be tuned well so we can really talk. I called from my gmail to ground and mobile phones but can't get any answer. I don't believe this unless I can really get a respond from my calls. I used it (in Vancouver) worked fine but the call phone icon in my gmail vanished, now I have to go Chat and drill down to my contacts and then cll from there, you click on to a contact and when the chat dialogue box opens there is a call option, pity they did that worked much better when I had the call option open and obvious. It worked fine for me, and I'm in Vancouver. I assume that b/c I'm in Canada I won't be able to top up my time from .10, but so long as I call Canada and the U.S. it's all free anyways! I was really amazed by Google, the way it handled the Google voice, and fortunately it was free for US and Canada, it is just so amazing. it is really good to make free calls. anyone knows how long will they allow us to make free calls. i am sure eventually they will stop it. call phone appeared for two days in my gmail account.But today it disappeared.Pl. help me how to get it again. I dialed and could hear the voice from the other end, but my voice was not heard by the party I called. Please advise me what I need to do so that I could be heard. I also would like to know how to get my own number so that it would not appear to others as a number from California by a unknown caller. Thanks. I love it, but why can't we make/receive calls from the Google Voice? Full VOIP calling controls should be right there on the Google Voice site. Maybe they're overhauling the Voice interface and will include this down the road? Today it was raining and stormy and my cell reception was terrible. I needed to attend a conference call, and thanks to this service I was able to! Also I didn't have to spend all of my monthly minutes on the call either! does the recipient of the phone call have to pay for it? like will it show up on their phone bill? especially with verizon? I have account 1 I loged in on this account with my laptop and I can see call icon in this account. I feel this system is bit bugy till this time. Hey, I am at the UAE. I called two days ago and it worked but not anymore available in my chat. Is it still available in the UAE. im in UK and been using this a bit but, there is no way i can be charged via my phone provider is there? im thinking since my PC only has access via filtered ADSL line surely its impossible to be charged for the calls? I am from India, i am not seeing the call phone options. what shall i do? i am from Malaysia, what can i get google phone number,and what can i do for call other country? i am from haiti, what can i get google phone number,and what can i do for call us and canada free? I used call phone option in Italy. I am left with balance in account. Now i am in India but I do not find that option avialble in my Gmail Account. I am not sure how to access that again..
Any one has idea about it? i am from saudi arab,what can i get google phone number. and what can i go for call us and canada free. Can you make calls to any phone that does not have this google app installed? ie regular land lines, cells, etc that are not hooked up to a PC and if so, at what rates? Can these calls originate from outside North America? Tbanks for your input ! I have made several call to places ranging from North Carolina to Hawaii, and have never been charged for using this service. And all the people I call, including my wife, have never seen a charge. I am pretty sure that your Aunt will not get charged. Be aware that there is a problem with many users getting caught in an endless loop of trying to install the voice plugin, trying to make a call and then being told to install the voice plugin again. This has been going on for 5-6 months, Google is aware of the problem but still hasn't done anything about it. It doesn't seem to be browser specific, but only happens to users of browsers other than Google's Chrome. I have same issue using google chrome... BTW i have two laptops one of them working fine and i can find call option while in second laptop i couldn't found call option, i use Google chrome on both laptops. I previously called my friends in us from my country Nepal successfully. Today, i tried to call but no credit to call msg occured. couldn't figure out what was wrong. Isn't it free to call to us for the year 2011? mine too! 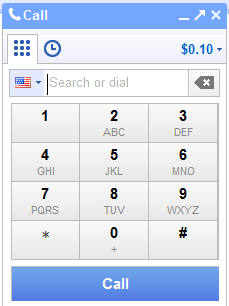 I can no longer call my relatives in the US it is asking for $0.01/min fee and it's asking for credits. I thought it's free for 2011?!!!!! it's just August!!!!!!!!!!! why is it not working 4 us since last 2 weeks :(((((((((( ...help me plzzz..it says .i dont have enough credit ..but us calls are free , then why m i facing this problem ?????????? According to Google, calls to the US and Canada are still free, but only if you are in one of the two countries. Initially, Gmail calls were supposed to be available only in the US, but the feature worked outside of US for some users. "Calls to the U.S. or Canada placed from outside these countries will be charged $0.01 per minute (or €0.01, £0.01, C$0.01 per minute)," so they're still cheap. @alex ..but i was able to call US PREVIOUSLY...WAT HAPPENED NOW? IS THEIR ANY OTHER WAY TO MAKE FREE PHONECALLS TO US VIA PC :/?????????????? i'm from Sri Lanka.Althese days i was calling Us And Canada for free.But now i'm been that i need credit.Pl help and reply. Why promote the bloody thing if it is not available in my neck of the woods. It would be a great thing in Oz due to our vast distances. Any way to call using my android phone in the UK? Sound quality with this app is awesome. Gmail doesn't work for windows 7, I have tried many time recently on 2012. I'm in Spain and set up U.S. google phone number to make calls to the U.S. Worked beautifully the first couple of days, but last night google wouldn't complete the call I tried to make and I got an email from someone trying to call me who wrote that my number didn't work. This is the message that came up on my desktop: Sorry! You do not have enough credit to make this call. Add credit. I can't get it to load on my laptop? I dont' get the activeX popup and can't get it to work.. Any suggestions? does anyone know if this aps offered for android phone? i can't seem to find one? the only way to use this is with a pc log in to gmail account then click call phone. I need one for android phone. Could somebody, please, tell how to find the right page for making phone calls ?! I installed it and it's work, but when i need to make call again threre is message " Sorry! You do not have enough credit to make this call. Add credit." can i make a call from a phone to a gmail account by assigning a number to the g mail account? To get the Google dial pad to come up, just go to where your chat contacts are on the side in your gmail, and scroll to the top of your contact list and you will see where it says 'Call'. Just click on that and the dialpad will come up where your chat window usually is. If you are in a different country then the USA or Canada, you have to buy credits to make phone calls. You can call for free from the USA TO the USA Or Canada, but must have credits to call outside the USA or Canada. If you are outside of the USA or Canada, you must buy credits to make calls. after one second it will be stopped man! I am living in London (uk) But mostly I use to call India for my personal as well as for business purpose. So can anyone suggest me how to make unlimited calls to India form UK , It would be help full for me. I think you should try Ozeki Phone System XE. I also use it and I often make calls aborad, like UK, India, Germany. Hello Alex I have read your blog article its awesome and I like the views you share in your blog. Thanks for sharing and keep going on. Thank you for nice post, Contact Gmail Support USA is there for you technical support. Get in touch with us USA for any kind of technical assistance. Hotmail technical support Canada Team of Microsoft's Hotmail/Outlook will help to fix account and password recovery issues. Call at: Hotmail Support Phone Number Canada at Toll Free Number +1 877 568 2495 for quick solutions. We have Gmail Helpline Number Canada 1-800-998-6716 with the name of Gmail Help Phone Number Canada, Gmail Support Phone Number Canada, Gmail Help Number Canada, Gmail Technical Support Number Canada, Gmail Support Canada so you can find us using these above keywords. Thank you for this nice post, Get Best tech support at Gmail Help Number USA at 1-888-582-4887 to solve tour account related issues. Nice Post, For quick solution Contact us at - Contact Gmail Support Canada 1-888-582-4887 Toll free number. Good to read , Call us at Gmail Support Ireland - If you do not verify your information, we can’t help you too to get your credentials back. So make sure before calling us that you have got all related information with you related to your Gmail account With the help of Gmail Helpline Number Ireland . Interesting, at Microsoft Outlook Support Canada 1-888-582-4887 We do troubleshooting to resolve windows related issues and carry out installation and configuration of windows drivers. Call experts at Microsoft Office Support Canada toll free Number 1-888-582-4887 for instant help and support if you have any issue with MS Window. Nice Post, For quick solution Contact us at - Gmail Customer Care Phone Number Nederlands Toll free number. haha Nice videos,thank you for sharing ! The above post seems to be very helpful for Gmail users. We also serve Gmail users at Gmail Help Desk Number UK to help them fix its issues. Are you going through the Skype related issues and looking for the best solutions? thaks for sharing this post with us. many people are facing problen in their opera they people can contact us we are here to provide the complete solution about the asusu router support. The Skype Online Support Number offers the required solution to the customers. If anyone wants to get the best customer support service then you can contact the Skype support number +1 855-676-2448? This team was formed after the termination of Deccan Chargers in 2012. The SRH IPL team played their first season in 2013. After the wait of four years, they managed to win their first title in 2016.
this is really nice and informative, Thank you for it!